APS-COD Army Public School COD,Khi. 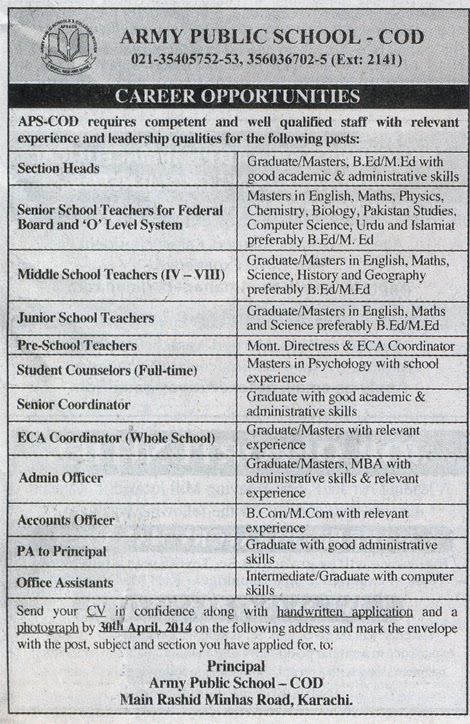 offers Section Head ,Senior School Teachers and Junior School Teachers jobs for their reputed APS - COD.Different posts have different criteria which is mentioned in the image below.all of the candidates who want to apply they can send their CVs and photograph before 30th April,2014 to the Principal - APS -COD,Rashid Minhas Road -Karachi. Item Reviewed: Section Heads Jobs In Army Public School COD ,Karachi 9 out of 10 based on 10 ratings. 9 user reviews.